In recent years the Horticultural Society has taken over from Perth and Kinross Council the care and maintenance of Nurse Peattie’s Garden . This involves us in regular tidy-ups from March to October. As you may know, the garden occupies a visually prominent site at the entrance to the village by the Ballo Burn. It includes some lovely trees and shrubs and it is a pleasure to sit and relax with the sound of water in the background and glimpses through the trees of village houses and the hills. The site of the garden is a part of the village’s former bowling green. The green was lost when the main road was re-aligned in the 1960s. The gate into the garden is the original bowling green gate. The garden is dedicated to the memory of Elizabeth Peattie who was the District nurse for this area for almost 30 years from 1936 to 1963. She was by all accounts a well-known and well-loved figure. At first she travelled to her work by bicycle (later motorised) and then by car: a vehicle purchased for her by the community after determined fund-raising efforts. The garden was inaugurated on 16th April 1966 which means that in 2016 we shall be celebrating its Fiftieth Anniversary. To co-incide with this significant milestone the Society is hoping to refurbish the garden with new planting. We are currently consulting on proposals to remove certain shrubs and trees and prune others in order to allow more light in and improve growing conditions. In the next few months we will present design plans to the village and will begin raising funds for the project. Have you noticed the changes at Nurse Peattie's garden? The latest have been the removal of the big fir at the fence on the roundabout side of the garden and the rebuilding of the wall which was in front of it. The fir tree spoiled the look of the gardens when entering the village from Perth and overshadowed and restricted growth in parts of the garden. 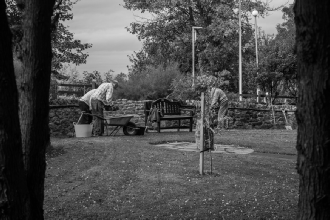 Many of us do not realise how much effort is put in by Abernethy in Bloom - a select band of navvies, all volunteers - to maintaining the garden. 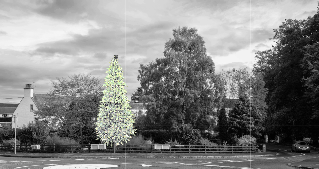 At the time this work was being planned for the garden the Community Council were looking for somewhere to site a second Christmas tree as the one at the school was not seen by those entering the village from the West. What could be better than this new space created right at Perth Road, Back Dykes and Main Street junction? When the fir tree was removed there would be an opportunity to get the council to put in a socket for a reasonable sized tree and to provide a power source for the tree lights. After all there was a lamppost very conveniently sited at the fence. When the tree was removed the council were approached and agreed to do the work but at a price - and what a price! To have this work done someone will have to pay £1800 and neither the volunteer gardeners nor the Community Council have that sort of money. It is the ideal site for the Christmas tree and it would bring a bit of seasonal cheer to the village, maybe the charity carol singers who perform in the streets of Abernethy every Christmas would give a carol concert under the tree.But none of this can happen unless the money can be found to pay for it. If each household receiving the Crier contributed £2.50 to the cause this would pay for the work and for the new tree lights necessary since the ones purchased last year were damaged by person or persons unknown. Any contribution, the bigger the better but still acceptable however small, will be gratefully accepted and can be placed in the boxes provided at Berryfields and Brian Greig's shop. We are all very grateful to both of these enterprises for making the facility available. Donations will also be accepted through the letter boxes at the addresses below. In these cases please put the donation in an envelope with a note of your name and address. All donations will be acknowledged. Many of you who were able to attend the carol service at the beginning of December will, I am sure, testify to what an enjoyable night it was and will hopefully wish that we do it again but this time with mains operated lights. Elsewhere in this issue you will see how much has been raised in aid of the Xmas tree lights. This has been very heartening and much appreciated but perhaps not everyone was able to get to the tearoom or Brian's shop or any of the drop off points. It was a good turn out on Saturday 7th May for the unveiling of the new information signboard at Nurse Peattie’s Garden and to celebrate fifty years since it opened. Although t his is the site of the community Xmas Tree and a major feature of the village only one Community Councillor was present at the ceremony. 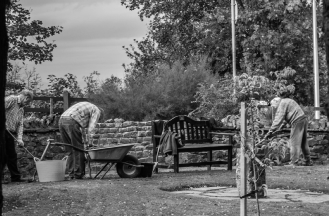 The weather was good and many villagers enjoyed light refreshments in the beautifully transformed garden although some perhaps were a little overcome by it all. The floral display made for a delightful atmosphere for all who were there and there was quite a light hearted and community feel to it all. Hopefully further meetings can be held in this delightful refuge in the village. Well done to all who got involved in the hours of hard work and the physical graft of refurbishing the garden and to the sponsors who funded it. You are a credit to the community. A special mention must be made of the sign which has been crafted in glazed tiles by Caroline Boyle.